Masjid-ul Haqq was purchased in 1998. 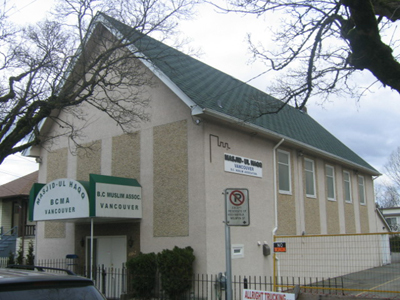 In 1998, the branch acquired the Kingdom Hall of Jehovah’s Witnesses, a church located at 4162 Welwyn Street, half a block north of Kingsway between Victoria drive and Knight street. The property consisted of two buildings: the first, containing a very spacious main prayer area. The basement consisted of two separate rooms along with an office, two bathrooms, an entry hall, a furnace room, an electrical room and a storage area. The second building was a small, two bedroom house in good condition. The structure was attractive because of its location(East Vancouver), its size (nearly 4000 square feet in the building, 1200 square feet in the residence) and its features (a prayer hall for women, a classroom and conference room). As a working church, the site also came with additional features such as an emergency lighting system, a public address system, burglar and fire alarms, two built in vacuum cleaners, exit displays and 80 chairs. This project was definitely a community effort, as the Vancouver branch team included 27 members. This Mosque came to be known as Masjid-ul-Haqq.